University of Florida, FL 10th-12th Grade Students worked on their projects over a 4-week time period during and outside of class. Which animals migrated across the Isthmus of Panama in the Great American Biotic Interchange? Students will construct an explanation based on evidence for how natural selection leads to adaptation of populations. Students will evaluate the evidence supporting claims that changes in environmental conditions may result in: (1) increases in the number of individuals of some species, (2) the emergence of new species over time, and (3) the extinction of other species. Students will work in groups to create a PowerPoint presentation that describes the migration of a chosen mammal that migrated either North or South across the Isthmus of Panama. As well, students will present their presentation to the class, and 3D print a significant fossil that they will be able to pass around during their presentation. Science:Reading scientific articles and researching about their chosen Animal. Technology:PowerPoint, 3D printing, Database use. Math: Geologic time, Data interpretation. Both, formative and summative assessments will be implemented to assess student understanding of the 3 dimensions of learning – disciplinary core ideas, crosscutting concepts, and scientific/engineering practices. Formative assessments: The teacher will ask questions and observe discussions during group work and the class discussions. Students understanding of the documentary will be evaluated by grading the questions on the handout about the documentary. Students understanding will be evaluated by their ability to summarize the article with the given graphic organizer. In Groups, students will complete a Powerpoint presentation about a chosen mammal that migrated across the Isthmus of Panama. Students will present it to the class. Students will be evaluated by the this rubric. Students watch the National Geographic video “Clash of the Americas.” This documentary describes the processes that formed the Isthmus of Panama and the migration of many different species across the Isthmus of Panama and the interactions between these animals from North and South America. About 3 million years ago the previously separate North and South American continents collided creating a new land bridge connecting the Americas. 19th century German paleontologist Karl Alfred Ritter von Zittel once stated that this meeting of the continents led to “one of the most remarkable faunal migrations in the geological record.” Paleontologists today refer to this migration event as the Great American Biotic Interchange, or GABI for short. Within the entire narrative of the GABI there are hundreds of smaller, interesting scientific stories to be told. One such story, that we will focus on here, is that of the well-known mammoth and its more obscure cousin, the gomphothere. Construct a hypothesis as to why the shape of these two teeth are different. Be as detailed in drawing your hypothesis as you can be. 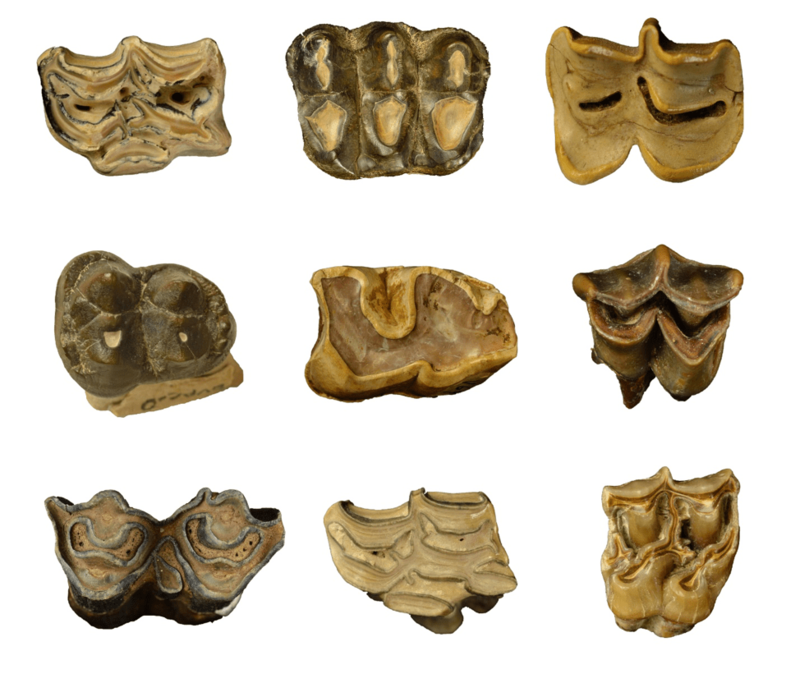 Study the following nine photos of the chewing surfaces (what scientists call the occlusal surface) of teeth from various fossil mammals. Under each photo, note if you think the pattern and shape of the occlusal surface is more similar to the mammoth or gomphothere. What features were important in making your choices? Crucial to understanding the story of the mammoth and the gomphothere during GABI is identifying where researchers have discovered fossils of each animal in North and South America. We’ll use an online database (GBIF- The Global Biodiversity Information Facility) to further study these distributions. 1. Navigate to gbif.org, a website that records occurrence record data for both fossil and modern animals. 2. Just above the search bar, click on Occurrences. 3. 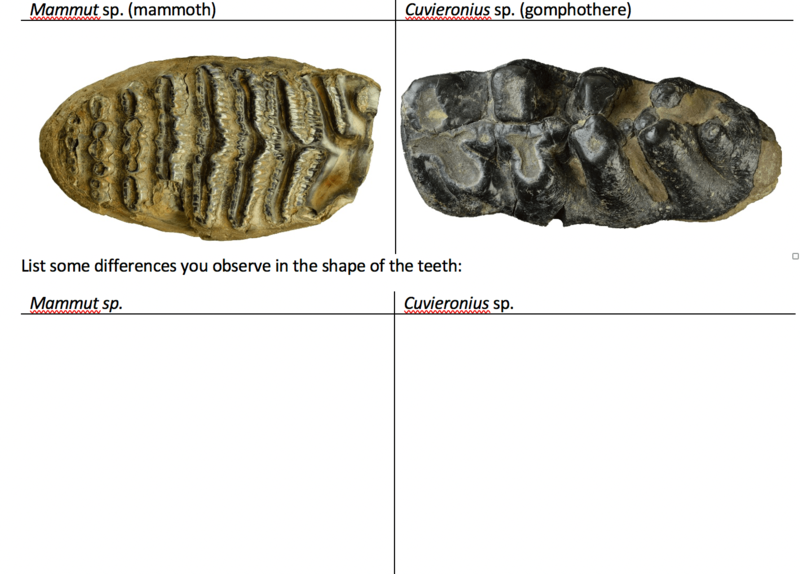 Where it says “Search all fields” in the top left type in “Elephantidae” (the family that contains elephants and mammoths) and then type in “Miocene” (the geologic epoch where elephant-like animals first occur in the Americas, 23 to 5.3 million years ago). 4. Click on the MAP tab at the top of the results pane to view where on the globe fossils of elephants have been found. 6. Start your search over by researching the distribution of “Gomphotheriidae” (the gomphothere family) in the ”Miocene” and record your findings on the corresponding map. 7. Continue this for elephants and gomphotheres in the Pliocene (5.3-2.7 million years ago) and the Pleistocene (2.7 million to 10,000 years ago). Note your observations on the distribution of elephant-like animals from the Miocene through the Pleistocene. How do they change through time? Students will watch the documentary “Clash of the Americas” and complete a handout with questions about the movie. Students will participate in a class discussion about the documentary. Students will read the article “Land Mammals and the Great American Exchange” by Larry G. Marshall, 1988, complete a graphic organizer used to help summarize the article. Students will participate in a class discussion about the article. Students will work in groups and create a PowerPoint presentation. Each group will pick an extinct animal that migrated north or south after the forming of the Isthmus of Panama, or one that was affected by it. The animal’s migration: Did the mammal migrate North or South? What is the timing of their migration? The scientific paper chosen to analyze: Describe the study; What was the study’s conclusion? What was the study’s evidence? The significance of your chosen fossil to 3D print, Reference Page. Construct an explanation based on evidence for how natural selection leads to adaptation of populations. Students will construct an explanation based on evidence for how natural selection leads to adaptation of populations. Constructing Explanations and Designing Solutions Students will evaluate the evidence supporting claims that changes in environmental conditions may result in: (1) increases in the number of individuals of some species, (2) the emergence of new species over time, and (3) the extinction of other species. Integration of Knowledge and Ideas. Before starting this project, students have learned about the processes that formed the Isthmus of Panama, as well as the theories given by Paleontologists for the timing of the formation of the Isthmus of Panama and their evidence. Want to add more reading and debate? Dissecting Battle of the Americas is a wonderful lesson that takes students into deep analysis of published data providing a great opportunity for analyzing and interpreting data and constructing explanations based on evidence.